Editor’s Note: We have updated this list for 2019 with some new bags we think you will love. Some of our initial picks have gone out of stock so we went ahead and updated our top picks, added more budget-friendly options, and even added a bonus section that recommends our favorite office-friendly backpack brands. We hope you enjoy the update! The best work bags for women are versatile, stylish and super functional. Simple enough, right? Then why is it so hard to find a smart and sophisticated backpack for work? It seems like most of our options are either stuffy business bags or backpacks that look like they belong in a classroom, not a boardroom. So we have done our research to find you 10 awesome bags that you can wear to work. We focus on sophisticated backpacks that are professional enough to wear at the office yet stylish enough for traveling, weekends or wherever else life takes you. Why choose a work backpack? Finding a business backpack that is both fashionable and office appropriate can be a difficult task. Most backpacks are that are functional are too bulky or look out of place at the office. Other backpacks look stylish and chic but leave a lot to be desired when it comes to everyday functionality. Below are our top picks for women’s business backpacks that are the best of both worlds: Stylish and functional. Slim and sophisticated enough for the office yet roomy enough to comfortably carry all of your daily essentials. The Knomo Beauchamp is our top pick for the best work backpack for women. What fits inside: The Knomo Beauchamp is a medium sized women’s backpack that is large enough for a 14-inch laptop and a tablet. The main compartment can easily fit items such as water bottles, lunch, and work files. The front pockets are perfect for small items such as keys, charging cables or a wallet. Who’s it for: The Knomo Beauchamp is perfect for women who need a versatile backpack that is sophisticated enough for work but stylish enough for casual weekend wear. One thing we love about the Knomo Beauchamp is its minimalist chic design that is as versatile as you are. It’s sophisticated enough to be worn at the office yet stylish enough to be paired with jeans while running errands on the weekends. Available in multiple colors to match your style, the Knomo Beauchamp is a winner in both style and function. Its modern design is showcased with its simple round-top silhouette and mature leather detailing. The backpack itself is not too large and bulky making it the perfect women’s business backpack to go with your office attire. Whether you are a daily work commuter or need a reliable bag to take with you to client meetings, the Knomo Beauchamp is capable of handling even the busiest of days. 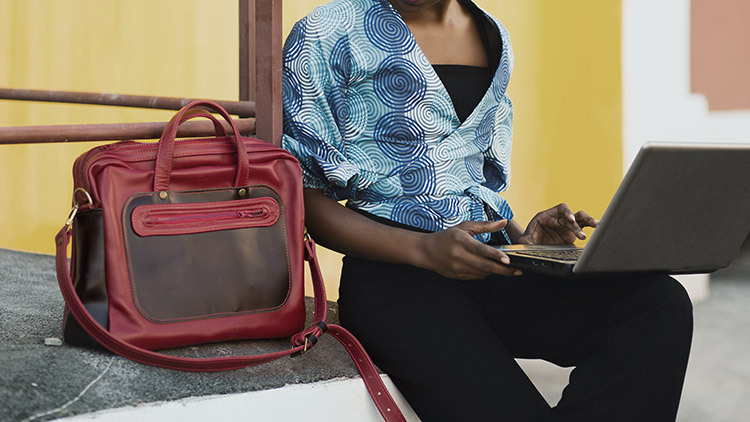 Unlike other backpacks for women, the Knomo Beauchamp is large enough to carry a 14-inch laptop and file folders that may not fit in smaller bags. Although the Knomo Beauchamp is our favorite backpack on this list, it still has a couple of cons we found worth mentioning. First, the Beauchamp is on the smaller side. If you are the kind of person who lugs lots of stuff to work everyday than this backpack may not be large enough for you. Another con worth mentioning is that the front RFID pocket can get tight when the main compartment is full making using the pocket a little more difficult than it needs to be. Can’t decide between a work backpack or a shoulder bag? Why not both? The Victorinox Harmony laptop backpack converts to a shoulder bag when you need it. We love its sleek and slim style that is professional yet feminine. What fits inside: The Victorinox Harmony is a medium sized backpack that has plenty of room inside its 14 liter main compartment for an extra pair of shoes for work to gym days, a packed lunch or a light jacket. The bag also includes a pocket for 15” laptop as well as a tablet. Who’s it for: The Victorinox Harmony is for those who don’t want to have to choose between a backpack and a tote bag. Compact yet large enough for the your daily carry, the Harmony is perfect for office commuters and business travelers alike. A convertible backpack is perfect for anyone who doesn’t want to choose between handsfree carry during busy commutes and a stylish handbag to carry into business meetings. The Victorinox Harmony can do both. The Victoria Harmony backpack also makes a great backpack to take with you during business travel. The backside of the backpack features a slip compartment that can be paired with luggage for easy carry when traveling. This slip compartment also hides the backpack straps when the backpack is ready to be used as a shoulder bag. Size-wise, the Victoria Harmony backpack makes a great personal item to take with you on flights. No bag is perfect and the Victorinox Harmony does have a couple of drawbacks worth mentioning. A common complaint is that the front pockets are too narrow to be functional, especially when the main compartment is full. It’s also worth mentioning that at 14 liters, some might still find this backpack to be too small. We don’t recommend it for anyone who needs to lug around lots of items to and from work everyday. In terms of size, we would put the Victorinox Harmony between a large tote and a medium sized purse. Keep in mind that its size isn’t a con as much as it is a personal preference but worth mentioning nonetheless. The Pacsafe Citysafe CX is a women’s backpack packed with anti-theft features that is perfect for work commuters and busy business travelers alike. What fits inside: At 17 liter capacity, the Citysafe CX is large enough to hold a 13-inch laptop as well as books, notebooks and business documents. Travelers will love how the roomy main compartment can comfortably fit a full sized DSLR camera, toiletry bags as well as their electronics (laptop, tablet, cables, chargers). Who’s it for: The Pacsafe Citysafe CX is perfect for busy work commuters or business travelers who spend a lot of time on subways, airports and crowds where pickpocketing or theft may be an issue. Its professional design and smart anti-theft features make this the perfect commuter and travel backpack. Packed subways. Bustling airports. Lunch with clients in a busy part of the city. If you work a job that requires lots of commuting or traveling then having a backpack with anti-theft features that can secure your personal and business belongings is a big deal. A lot of the best work bags for women do not have these safety features which gives the Pacsafe Citysafe CX a serious edge over the competition. Although we love its state of the art anti-theft features, where the PacSafe really shines is in its stylish and feminine design. Its gold zipper pulls and hardware accents really give the backpack a mature and refined look that plays well with business attire. While having enough space inside for all of your daily essentials, the Citysafe CX is still slim and sleek enough to not look out of place when worn at the office. As far as women’s work bags go, the PacSafe Citysafe CX is a home run in terms of both style and function. One con worth mentioning is that the shoulder straps on the PacSafe Citysafe CX backpack are a bit thin and can start to dig into your shoulders after prolonged wear. Although not a deal breaker, the shoulder straps could use more padding for more comfortable all day wear. A merger of fashion and function, the Kroser laptop backpack proves that sophisticated backpacks don’t have to come with a high price tag. What fits inside: Large main compartment is roomy enough for a 15-inch laptop plus books, business files and everyday items. All of your smaller items can be tucked away in the internal organizer pockets that fit everything from tech accessories to sunglasses. Who’s it for: The Kroser laptop backpack is great for those who need a roomy women’s work bag on a budget. At under $50 this backpack is a steal. Very rarely do you come across a cute women’s work bag with plenty of storage at a budget price. The Kroser laptop backpack features a roomy main compartment that is large enough to store a laptop, business files and binders. It’s the perfect backpack for women who haul a lot of “stuff”. 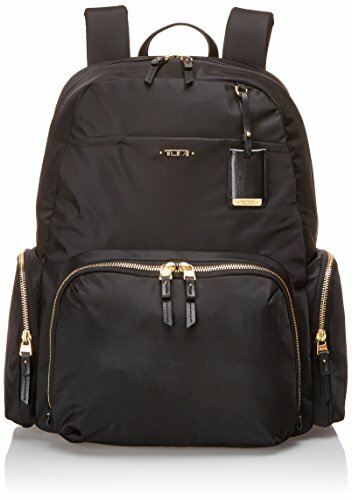 The outside of the backpack is made of out a water resistant black nylon and its PU leather accents and gold zippers gives it a polished look that won’t look out of place at the office. The inside is lined with a teal lining that makes it easy to quickly find what you are looking for inside the bag. We love all of the small details that make the Kroser laptop backpack so special. One cool feature is the external USB port that allows you to charge your phone while on the move (portable battery pack not included). The bag also features a padded back that makes all day carry easy and comfortable. Large side pockets are perfect for water bottles, workout shaker bottles and umbrellas. You sometimes don’t even get these kinds of practical features in more expensive bags so it’s amazing to see them included in such an affordable backpack. There are two main complaints with this backpack. The first; this bag isn’t made with the best quality materials. One of the drawbacks of purchasing a backpack so cheap is that you run the risk of not having it hold up over heavy use. A common complaint was that the zippers can sometimes stick. The second con is how the top of main compartment is designed. The top of the bag is reinforced with a steel frame to keep the bag’s shape even when empty. Unfortunately this means that you can’t “stuff” the bag without running the risk of not being able to zipper it shut. Although this steel frame is a nice touch when it comes to the bag’s looks, it can become really annoying when trying to pack extra items in the main compartment. Refined and functional design makes the Tumi Voyageur Ursula a near-perfect women’s business backpack. The TSA friendly laptop compartment makes it great for business travel. What fits inside: The Tumi Voyageur Ursula is one of the brand’s larger women’s business backpacks. A roomy main compartment has enough space to fit business files and binders, an extra pair of shoes and even a light jacket or sweater. A separate TSA friendly compartment fits both a 15-inch laptop and a tablet. The bag features plenty of small organizer pockets for pens, business cards, wallets and keys. Who’s it for: Women who want a sophisticated backpack made especially for business carry. The Tumi Voyageur Ursula combines practical features with a refined look fit for formal work settings. Plenty of pockets for keys, phones, water bottles, business cards and more. 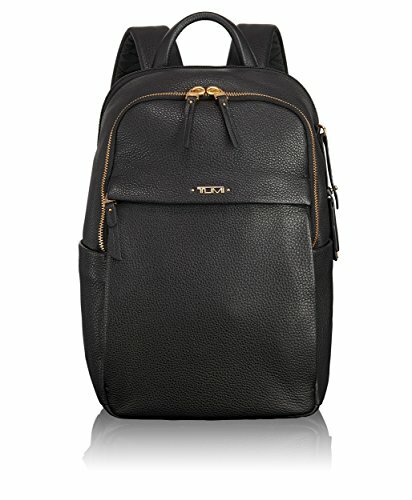 The Tumi Voyageur Ursula is a sophisticated women’s backpack that was built for business carry from the ground up. The main compartment on the Tumi Voyageur Ursula is large enough for most daily essentials including business files and binders, a lunch or even a spare pair of shoes. But it’s the small attention to details that sets this backpack above the rest. We are talking about special pockets for business cards, pens and keys and water resistant side pockets for water bottles or umbrellas. Versatile enough to be used at the office or at the airport, the Tumi Voyageur Ursula features smart features that make traveling for business a breeze. The backpack features a separate laptop compartment that opens up flat for easy security checks. There are also a hidden pocket on the outside of the bag for quick-access to a cell phone, boarding passes or a passport. Another great travel features is the add-a-bag sleeve that allows the Tumi Voyageur Ursula to be attached to luggage handles for easy carry at airports. With all of these features and more, it’s no secret that Tumi makes some of the best work bags for women. When it comes to quality and craftsmanship there are little complaints about the Tumi Voyageur Ursula. The only con worth mentioning is that this bag is a bit on the pricey side for the features it offers. The Hedgren Kayla is a woman’s laptop backpack that converts into a hand bag when you need it. Its quilted body and leather accents give it a chic yet sophisticated look that is perfect for work or play. What fits inside: We like to describe the Hedgren Kayla as a purse meets a laptop bag. Although it’s a smaller backpack it can comfortably fit a laptop up to 15.6-inches, chargers, a wallet, notebooks, glasses, purse items and an umbrella without the bag becoming too full. Its carrying capacity is thanks to its generous main compartment and useful organizer pockets. Who’s it for: Someone who needs a versatile bag that can be used for work, travel or on the weekends while having a sophisticated look that is fun and feminine. The Hedgren Kayla is perfect for anyone who can’t choose between a women’s work bag and a backpack. Thanks to its convertible design, the Hedgren Kayla allows you to have the best of both worlds in one stylish bag. The shoulder straps can be tucked away in the back panel when not in use and the leather top handles make for easy carry when you want to wear it as a hand bag. We think the all-over quilted pattern is a nice playful touch that is still mature enough to wear with your work outfits. Unlike other bags that use gold zippers and hardware, Hedgren opts-in for silver zippers and hardware to give it its polished look. Frequent travelers will be pleased to learn that the back panel features a velcro pocket that allows the Hedgren Kayla to be attached to luggage handles for easy airport carry. Its size and storage capacity also make it a great carry-on personal item on flights. The one con of the Hedgren Kayla worth mentioning is the front pocket design. The front pocket is held shut by a magnet which makes it easy to grab small items quickly. Unfortunately this design also makes it easy for pick-pockets and thieves as the magnet gives them easy access to the contents inside the front pocket. This could be a problem for city commuters or travelers who are at risk of theft in large crowds. Ultra lightweight and rain resistant, the Baggallini Essential Laptop Backpack makes carrying your work essentials easier than ever thanks to its smart organizational features and office-friendly design. What fits inside: The main compartment comfortably fits a backpack, some business files and folders and even an extra sweater. Front compartment has plenty of organizers that are great for smaller items such as pens, phones, business cards or purse items. Who’s it for: Anyone who needs a simple backpack without the bulk. With plenty of organizers and pockets there is more than enough room for daily work essentials. One of the reasons we love the Baggallini Essential laptop backpack is because it keeps things simple. There are no loud patterns on the backpack and its profile is classic in design. But while it’s simple, the Essential backpack is no ordinary work bag. The first thing you’ll notice is that the Essential backpack is smaller in size to better fit people with small frames.. As many women know, it’s already hard enough finding a functional backpack without the ugly bulk. Baggallini does a great job at finding the right proportions so that people with smaller frames can comfortably wear this backpack without feeling like they are going on a 3-day mountaineering trip. Simple design choices such as two side water bottle pockets and an internal phone pocket make the Baggallini Essential laptop backpack a home run for anyone who values functional storage. Although the main compartment is smaller than most other full sized backpacks, its numerous pockets and organizers make up for it. Although Baggallini advertises this backpack as fitting 15-inch laptops, many users have said this is not the case. Unfortunately, the laptop compartment may actually only fit 13-inch laptops comfortably. This is an oversight that hopefully Baggallini fixes in the future versions of this bag. Estarer offers a sophisticated backpack for work, weekends or travel at a budget price. With roomy compartments, an elegant design and a slim feminine profile this backpack is destined to become your new everyday bag. What fits inside: The main compartment is wide enough to store a 15-inch laptop in its padded compartment and A4 files and binders in the main area with enough space for books, an umbrella and other work essentials. Pockets and organizers are perfect for smaller items. Who’s it for: This Estarer backpack is perfect for anyone who needs an elegant laptop backpack for work, weekends and travel without the high price tag. Estarer offers a great women’s work backpack that is sophisticated as it is functional. The best part? You can buy one of your own for under $50. One thing we really love about this backpack is it’s versatility. Not only will it make a great women’s work bag, but it can also double as your go-to weekend or travel bag. This is thanks to its large laptop compartment, wide main compartment and all of its smaller pockets and organizers that make stashing away smaller things such as wallets, glasses and purse items a breeze. The bag itself is made from PU leather, which is a type of fake leather that is made to look like the real thing. This is good news for anyone looking for a vegan work bag for women or for those who like their products to be cruelty free. Since this backpack is made from PU leather we can’t expect it to age as well as a real leather bag. Higher end leather bags who use real good quality leather tend to age the best as the leather forms patina and character the more you use it. Unfortunately, this isn’t the case for PU leather and it will show after prolonged use as the PU leather gets scratched or scuffed. Simply put - this might not be a “forever bag” and will need replacement after a while. Kenneth Cole designs a true women’s professional work backpack from the ground up with their Sophie business backpack. This backpack is stylish, functional and a great alternative to more expensive work bag brands. What fits inside: Separate padded pockets for both a laptop up to 15.6-inches and a tablet. Roomy main compartment for business files, binders and books as well as personal items such as a sweater or lunch. Side pockets are perfect for water bottles or an umbrella while the front storage pocket is great for small things such as wallets, pens or purse items. Who’s it for: Anyone who needs a large and roomy business backpack that is still stylish and professional. 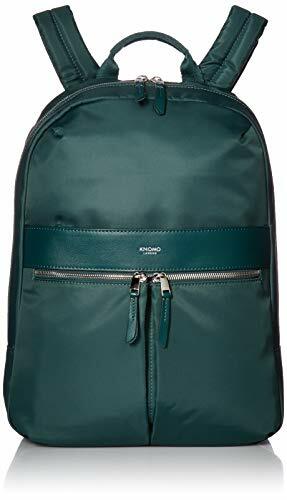 Kenneth Cole is known for their work backpacks for men so it’s a real breathe of fresh air to see them focus on work backpacks for women and people with smaller frames. Unlike bags from other brands, the Sophie backpack was designed from the bottom up to be a work backpack for women. It’s roomy main compartment is large enough for your daily work essentials plus extras. And all of its pockets and organizers makes it a breeze to easily find what you need. The styling is great, especially if you are looking for a Tumi alternative but at a much cheaper price. In fact, we think the Kenneth Cole Reaction Sophie backpack rivals Tumi’s Voyageur series of bags in terms of style and functionality. 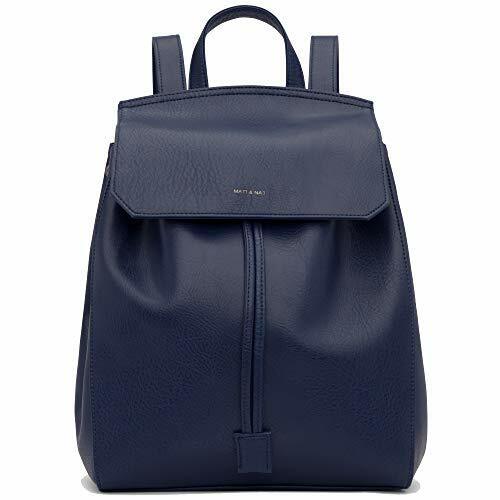 The Sophie backpack is available in black and navy blue. Both color versions feature gold zippers and hardware with black leather zipper pulls and handles. These small details are what really elevate the backpack from casual to work appropriate. Along with the small details, the bag itself is made from a silky nylon that fits right in at the office. 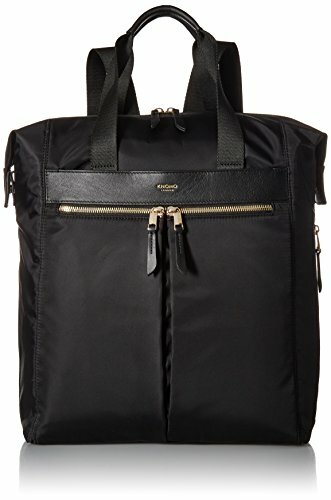 The biggest complaint with the Kenneth Cole Reaction Sophie business backpack are with the shoulder straps. The shoulder strap material feels on the cheaper side which is disappointing for a bag at this price point. The strap buckles adjust too easily and may need readjusting more often than it should. Wenger offers an elegant way to carry your laptop and other work essentials with their Alexa women’s business backpack. 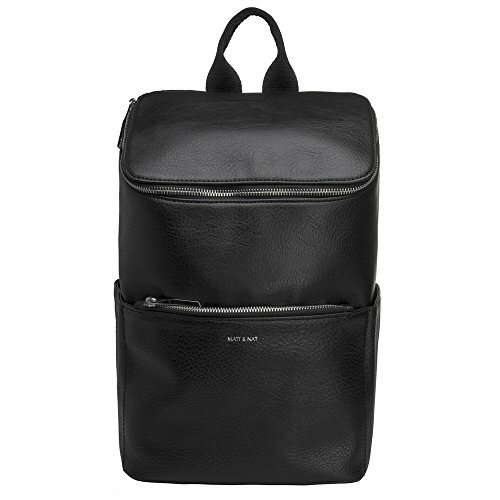 Sleek, slim and sophisticated this backpack will fit right in at any office. What fits inside: Separate laptop and tablet pockets allow you to carry a laptop up to 16-inches as well as a full sized tablet. Files, binders and notebooks fit comfortably inside the main compartment. Front pockets allow storage of smaller items. Who’s it for: For anyone who needs a simple work backpack that can carry a large laptop as well as daily essentials. One of the first thing you might notice about the Wenger Alexa is its sleek profile. This is achieved by cutting back on some common backpack features such as water pockets or exterior front zipper pockets that usually give backpacks their bulky appearance. Instead, the Alexa backpack opts-in for flat front pockets, a sophisticated buckle strap design and a simple silhouette to give its refined look. With the Alexa women’s business backpack, Wegener proves that elegance can be found in simplicity. Although this backpack is great for larger laptops, the main compartment leaves little room for much of anything else. This backpack is great for laptops, some files/folders and your purse essentials. If you need a bag that can hold more than the Wenger Alexa may not be for you. If you are trying to find a sophisticated backpack for work, it can be challenging to find one that ticks all the boxes. This is especially true for women’s work backpacks that need extra features such as laptop compartments and enough room for daily essentials. Luckily for all of us, some of our favorite brands have plenty of sophisticated backpack options for both work and play. Long time readers might be familiar with Matt & Nat as we have featured their backpacks in the past. The brand name Matt & Nat is short for MAT(T)erial and NATure. The brand focuses on using the two to bring about beautiful bags made out of vegan materials. The problem with most backpacks is that they can look incredibly casual, especially when worn in more formal work environments. While some brands may offer one or two work-friendly options, Matt & Nat offers an entire line of sophisticated backpacks to choose from. The brand does a great job at offering structured backpacks in a modern minimalist style that is not only polished but fun and stylish. We recommend Matt & Nat if you are look for small to medium sized women’s backpacks for work. Knomo London is a brand that specializes in urban bags and accessories. Their products blend fashion-forward designs with real life functionality which make them perfect for work or travel. We have found that Knomo makes some of the best work backpacks for women. Their use of premium materials such a splash-resistant nylon and full-grain leather give their bags a sophisticated look that few brands compete with. Their backpack colors are mature and neutral and their designs are minimalist cool. You really can’t go wrong with colors like fig, dark navy and deep pine when choosing a backpack that goes perfectly with your office wardrobe. If you spend any amount of time looking for a sophisticated backpack for work then you’ll notice that many brands are too focused on how a bag looks without much consideration on how it will be used. Backpacks with tiny main compartments, not enough pockets and cheaply made materials are all too common. Luckily, Tumi isn’t one of those brands. What we love about Tumi is that they make stylish bags that can actually be used in the real world. Tumi backpacks are designed for business and travel and because of this you’ll find sophisticated backpacks for women that can actually hold up to a busy lifestyle. Although on the pricer side, Tumi’s quality makes it all worth it. Everlane is a brand known for their stylish basics and ethical business practices. Their line of backpacks and bags is proof that simple classic styles can be all it takes to make a dependable work bag you’ll love using. Everlane’s attention to small details are what elevates an otherwise casual bag to a sophisticated backpack that won’t look out of place at the office. Details like high quality zippers, leather accents and mature silhouettes are what separates Everlane from other brands in its price range. If you are a fan of Everlane’s modern unisex style, we also recommend you check out our list of backpacks like Everlane. So you are looking for the perfect way to carry your work essentials? The best work bags for women come in different shapes and sizes. It all comes down to what you need in a work bag and which style you are comfortable with. Each type of bag varies in style, formality and carry capacity so it’s important to know the difference before you purchase your next work bag. Totes are best described as large unstructured bags that are square or rectangular in shape. These bags usually have two handles for easy hand or shoulder carry. Tote bags are also known to have open tops for easy access to the contents inside. Although open tops are usual in tote bags you can also find some with a snap enclosure or even a zipper enclosure. Totes have grown in popularity in recent years as the go-to business bag for many professional women. Their large capacity and wide range of styles and materials allow totes to be dressed up or down making them a popular choice for everything from work to weekend trips. Work tote bags that have a focus on business carry will include laptop sleeves, and organizational pockets on the inside. Larger than a purse yet smaller than a tote bag, work satchels are a happy medium in terms of size and carrying capacity. Unlike tote bags, satchels are structured and have zipper and buckle enclosures instead an open top. Satchels usually have short handles on top in addition to a long strap that allows the bag to be worn over the shoulder or crossbody. Satchels are usually made of fine leathers and hardware that can give them a much more refined and professional appearance. Since work satchels are on the smaller side, they usually aren’t large enough to carry laptops or work files and folders. This is important to note if you need to carry more than just some personal items and smaller work items. In the past wearing a backpack to work was a faux pas. Backpacks were for college students, not the office. And it’s easy to see why that was the case. Most backpacks were loud, unstructured and made of materials better suited for a hiking trip. But today we can confidently say that this is no longer the case thanks to the introduction of women’s business backpacks. Sophisticated backpacks are a relatively new thing with brands who traditionally made luggage and work bags finally also designing work-appropriate backpacks. Brands like Tumi, Knomo London and Samsonite are all great examples of brands who began to incorporate professional looking backpacks into their product mix. But work backpacks are more than just refined style. The best work backpack for women has a laptop compartment, a main compartment large enough to fit business files and folders and plenty of compartments for small work essentials such as pens, business cards, water bottles, charging cables, etc. The perfect work backpack is both stylish and functional. Pros: Easy hands-free carry makes backpacks perfect for commuters. Larger carrying capacity. Cons: Can easily look out of place at the office unless you stick to high quality backpacks with sophisticated designs. Convertibles are bags that can switch between a backpack and a satchel or a tote and a backpack. These bags usually have backpack shoulder straps that can be tucked away and longer handles so that the bag can be used as a handbag or crossbody. A good example of a convertible is the Victorinox Harmony Convertible Laptop Backpack. Convertibles are ideal for women who don’t want to choose between a backpack and a handbag/tote and like the idea of having multiple carry options in just one bag. Another type of women’s professional bag is the rolling business brief. Also sometimes called a mobile office, a rolling business brief is a large briefcase that is supported by two wheels much like luggage. A rolling business brief has the most carrying capacity out of any of the women’s work bag options. It can store large laptops, tons of business paperwork, files and binders while still having room for personal items such as a change of clothes and a packed lunch. This type of work bag is best for women with jobs that require a lot of travel where they must take their work with them. Although used sometimes by commuters, rolling business briefs are commonly seen with business travelers at airports. Today it’s easy to find a stylish rolling business brief from most brands who make luggage and business bags. Backpacks are a great blend of convenience, carrying capacity and style. This is and more is why backpacks are our favorite professional bags for women. But why choose a work backpack over a satchel or brief? Let’s find out. Great for commuters - Unlike other types of women’s professional bags, backpacks allow for true handsfree carry. Juggling a phone, subway pass and coffee during a busy morning commute is stressful enough, why add a work bag to the mix? Backpacks are ideal for city commuters and other busy professionals alike. Backpacks can be the best balance of functionality and style - Larger storage capacity and plenty of pockets and compartments make women’s business backpacks perfect for those who need a work bag that can do a little of everything. And now with the latest styles, women’s business backpacks are as office-friendly as ever without being too boring. With convertibles you don’t have to compromise - Not ready to let go of your trusted tote bag? Consider picking up a backpack/handbag convertible. The Hedgren Kayla and Victorinox Harmony are great examples of backpacks that give you the versatility of handbag or tote when you want it with the convenience of a backpack when you need it most. Not too long ago we wrote a guide on how How To Choose a Backpack for Work that is Sophisticated and Stylish. We encourage you to give that guide a read if you are looking to purchase a new backpack for work. But if you just want the basics, below we go over some tips on how to pick out a work appropriate backpack. Find the right size - Shopping for a women’s backpack is a little different than shopping for other types of bags. With backpacks, proper fit is very important and this is especially true for people with smaller frames. Although backpacks aren’t inherently gendered products, some business backpacks may be too large for some women to comfortably wear. Wearing a backpack that is too big for your frame is more than just funny looking, it can also be uncomfortable to wear and cause back problems over time. This is why the first rule when shopping for a new work backpack is to makes sure it’s the proper size. Find the right color and material - Avoid backpacks with “sporty” colors that are better suited high school sports than a client meeting. Instead opt-in for mature colors such as black, tan, navy and burgundy. Backpack materials should also be kept high grade. Leather is always a good choice. But nylon and canvas are also great if the colors are kept mature and sophisticated. Function is important - It goes without saying that function is just as important as style when it comes to a business backpack. Make sure your new backpack has all of the features you find important to get you through your work days and busy commutes. Do you like to carry drinking water wherever you go? Then make sure your backpack has a water bottle pocket. Do you have a large laptop? Then make sure your work backpack has a laptop compartment large enough to fit yours. The best women’s backpack for work is determined by how well it meets your needs.